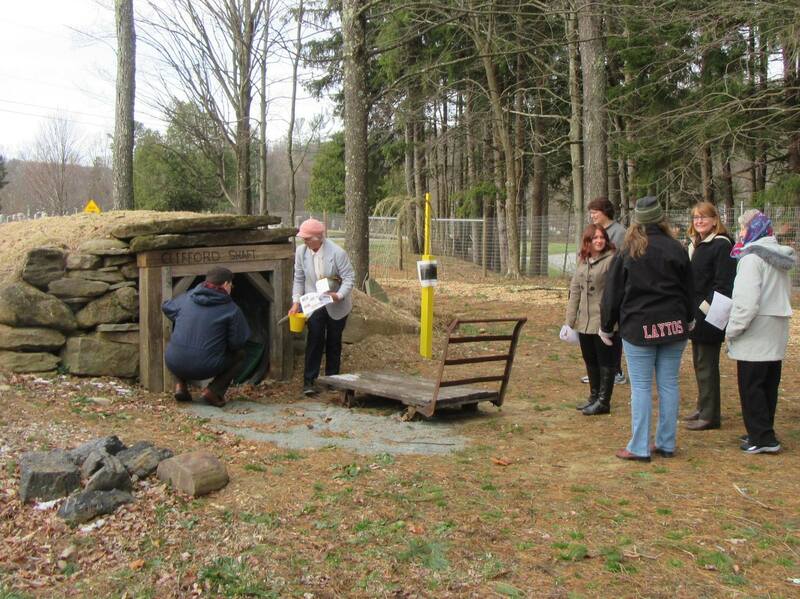 Bradford County Commissioner Ed Bustin (top, left) takes a look into the mock Clifford Mine Shaft in the Children’s Garden at the Clifford Township Community Center, as Sandy Wilmot (second from left) gives Endless Mountains Heritage Region staff and board members a tour of the interactive play area prior to an April 5 meeting. Board Members of the Endless Mountains Heritage Region (EMHR) met in Clifford Township in Susquehanna County on April 5 to tackle an aggressive agenda that included ongoing and potential projects, as well as a change in the way EMHR will be identified in the future. Partner projects such as interpretive signage, walking and driving tours, and a children’s garden in Clifford Township are viewed by the board as models that other communities in EMHR’s four counties – Bradford, Sullivan, Susquehanna, and Wyoming – can replicate or modify without as much need for timely and costly studies and design. In the past year, for example, EMHR has helped to facilitate funding for signs in Bradford and Wyoming counties that show the locations of museums, historical sites, parks, public lands, and vistas. A sign erected in the State Game lands that flank Route 487 in Sullivan County brought to light the “lost” lumber town of Ricketts that once straddled the Sullivan and Wyoming county borders there. Likewise, a children’s garden started in Clifford Township, Susquehanna County, last year combines local history and hands-on activities for families visiting the township’s community center, recreational areas, and the Clifford Township Historical Society (CTHS) Museum. Prior to the April 5 meeting, CTHS president Sandy Wilmot took board members on a tour of the interactive play area, which includes a butterfly garden, Native American village, flagstone maze, and pioneer homestead. 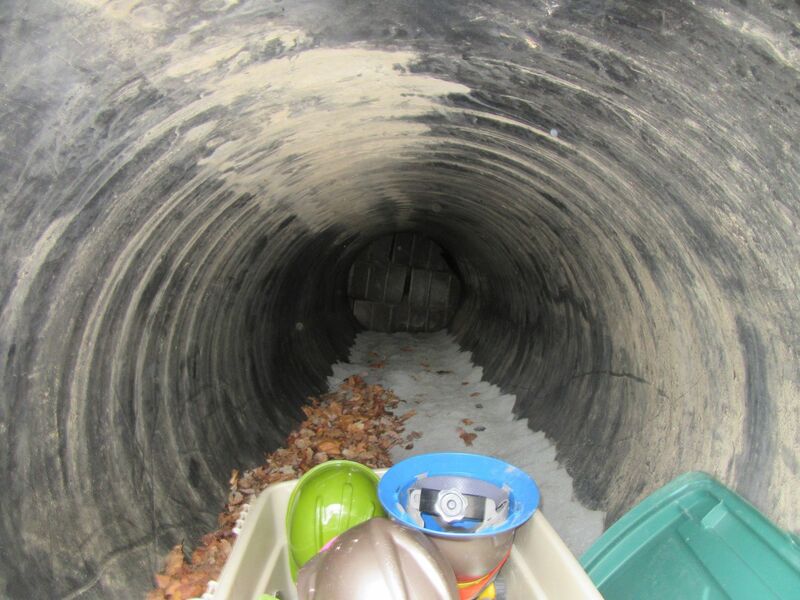 Once such projects are completed, EMHR executive director Annette Schultz noted, community leaders throughout the Region are invited to visit and determine how similar concepts can be brought to fruition in their respective municipalities. A wayfinding map and sign that shows heritage sites and outdoor attractions is in the works for Susquehanna County, and a recent round of applications for Department of Conservation and Natural Resources (DCNR) grants included plans for two more signs to mark historic sites in Sullivan County. Ten applications were recently ranked by a Project Review subcommittee and presented to the board. In addition to the Sullivan County signs, some of the proposals deemed most viable included repair of the roof gutter system of a theater in Bradford County, the implementation of a parks and trails project in Wyoming County, and the funding of two museum exhibits in Clifford Township. Final awards will be determined when the availability of DCNR funds is confirmed. A discussion at a February meeting about the perception of EMHR by the public was brought back to the forefront on April 4, leading to a decision by the board to file a “fictitious name” document with the state to give the board a new name. “We need to find a way to differentiate for the public and potential supporters between who we are and who we serve,” said Schultz. Board members concurred and determined that EMHR’s board is actually an “association” that functions as the liaison between the organization and the residents and non-profit organizations in each county, while the Region literally refers to the area served. Pending consultation with EMHR’s solicitor and completion of a Fictitious Name Registration form with the state, the board unanimously approved a motion to begin referring to the governing body of EMHR as the Endless Mountains Heritage Partnership. Other new business included the finalization of a schedule for 2016 River of the Year events cosponsored by EMHR and other groups. An update will be released to the media in the coming weeks. Meanwhile, the current list can be viewed at www.endlessmountainsheritage.org under the Water Trails Tab. 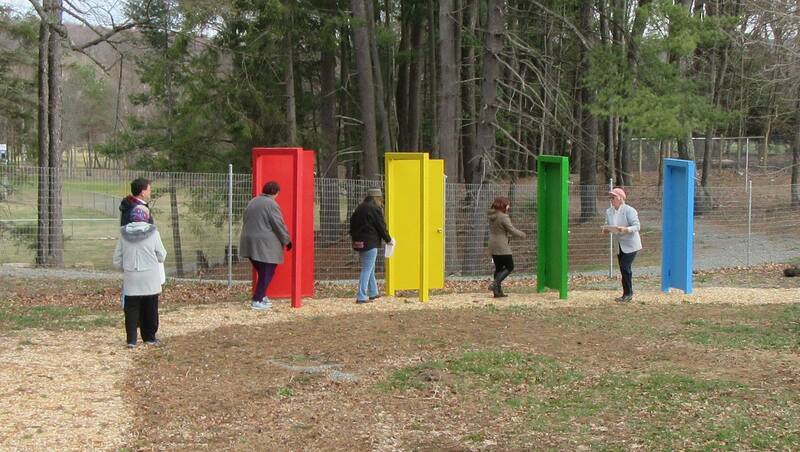 Clifford Township Historical Society president Sandy Wilmot (above, far right) invites Endless Mountains Heritage Region staff and board members to pass through the Doors of History at the Township’s Children’s Garden, for which construction was begun in 2015. Very nice job Rick!! Thanks for sending it to us!